The name is beautiful. Tranmere Rovers Football Club. It’s lyrical, iconic, and fabulously traditional. It’s been part of the local parlance for 131 years, since the fleeting Belmont FC was renamed in 1885. The Rovers adjunct is fairly popular in the pantheon of English football, with Tranmere being the fourth major club to adopt it, after Blackburn, Doncaster and Bristol. However, the etymology of Tranmere is entirely unique in the top five divisions. Indeed, it’s one of the most distinctive names ever associated with the game on these shores. It’s a story that deserves greater appreciation. Tranmere is a moniker of Norse-Viking origin, and for a long time, Rovers were the only Football League club that could make such a claim. That continues in the National League, as Tranmere boasts a heritage quite unlike any other English club. The word can be traced to AD 902, when a group of Vikings, largely of Norwegian descent, settled on the Wirral after being forced out of Dublin and Anglesey. Led by Ingimund, their ambitious leader, these Vikings sought more room for farming, away from vast overcrowding back home. With permission from Edelfrida, queen of the Saxons, northern Wirral became their new home, and a mass migration by longboat followed. A large community grew, with its own language and even a parliament situated at Thingwall. The township of Tranmere was created imminently. It’s likely that the Vikings saw a heron, or crane bird, perched on a nearby sandbank, and the location was duly dubbed Trani-Melr, meaning sandbank with the herons in Norse. That appellation later morphed into Tranmere, and has remained untouched for over 1,100 years as a proud nod to the Viking bloodline of Wirral. While perhaps the most famous, Tranmere is far from the only Norse-Viking place name on the Wirral. In fact, over six hundred places on the peninsula have Scandinavian etymology. From Birkenhead, meaning headland growing with birch trees, to Irby, meaning settlement of the Irish, Wirral is a veritable goldmine of Viking paraphernalia. Claughton refers to a hamlet on a hillock, while Heswall was hazel spring in Norse. As the last settlement in the Viking catchment area, Raby can be read as village at a boundary, and Thingwall translates to assembly field, as the seat of power in the region. There’s always been an undercurrent of pride among Rovers fans with regard to the club’s heritage, even if official recognition has been scarce. In 2014, a leading expert on the matter, Professor Steve Harding, went slightly too far in suggesting that the club rebrand as Viking Tranmere FC, but his sentiment was well placed. Rovers really should do more to acknowledge their ancestry, even if only from a marketing standpoint. It’s a compelling tale that people want to know more about. Despite a lack of official hoopla about the Norse-Viking connection, it’s great that Tranmere stands as a lasting tribute to a significant portion of Wirral history. The club has a distinctive identity rooted in centuries of tradition, and every time it takes the field, the original settlers of our peninsula are represented in name and spirit. That’s brilliant. That’s important. That’s worthy of greater attention. Whereas archaeologists obsess over obscure relics planted in nondescript fields, the layman can view Tranmere Rovers as a modern manifestation of an ancient legacy; a tangible avatar of our Viking patrimony. Up to 50% of Wirral residents can trace their DNA back to Norse origins, so what better way to honour that phenomenon than by supporting a football team of similar constitution? I often wonder what Ingimund would make of it all. In terms of recreation, the Vikings enjoyed wrestling, swimming and horse fights, so football wouldn’t have been too great a leap. Furthermore, the Norsemen made repeated attempts to extend their Wirral enclave by annexing Chester, so perhaps they looked down with a smile as Rovers beat their local rivals home and away this season. In this regard, the club enjoys a thriving fan club in Norway, and loyal supporters have travelled from Scandinavia to support Tranmere for decades. Many were lured by the close proximity of Liverpool and Everton before falling in love with Rovers, while some became fascinated with the club purely from a heritage standpoint. Regardless of how these intrepid souls arrived at Prenton Park, we must do more to accommodate them and affirm this historic bond. 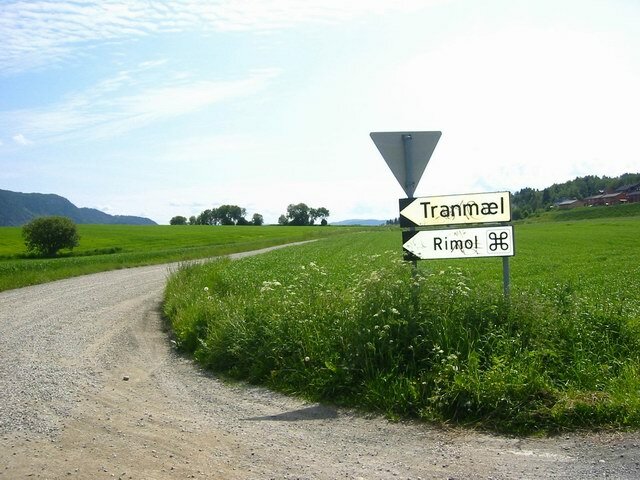 More specifically, there is even a town named Tranmæl in Trøndelag, a region in central Norway. Perhaps more could be done to solidify the connection between it and the British counterpart? Likewise, places bearing the name Tranebjerg in Denmark and Tranby in Norway are believed to be slight connotations of Tranmere. Perhaps Rovers could look to honour those regions in some way, and expand the fanbase by reaching out to the local population? Perhaps some kind of pre-season tour could be arranged? Tranmael in Trondelag, Norway. Photo credit: Stein Thue. In terms of other Scandinavian uses of Tranmere, it would be remiss not to mention Martin Tranmæl, a radical Norwegian socialist who championed workers’ rights in the 1920s and 30s. He was one of the most influential figures in the history of Norwegian politics, and a key member of the Nobel Peace Prize Committee, although details on the development of his family name are sketchy at best. Ultimately, the link between our beloved football club and the Vikings can be seen as incredibly strong or tenuous at best, depending on your viewpoint. However, for the romantics among us, it’s brilliant to consider Tranmere Rovers as the living embodiment of Norse-Viking culture on the Wirral. More than any rock or mere or monument, the name of a football club keeps that flame burning, from one generation to the next. We should never allow it be extinguished. Loving learning so much about the history.